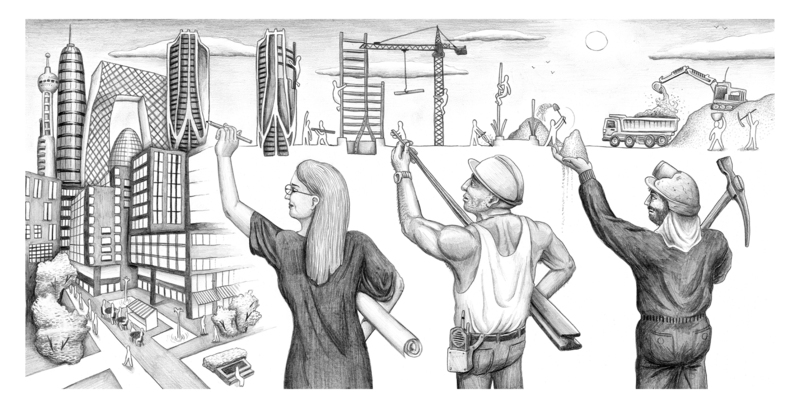 As a production process, architecture depends upon the labour of a huge pool of architectural professionals, often underpaid and overworked due to that all-too-common assumption that people following their passion needn’t be fairly remunerated for their labour or expertise. Meanwhile, the wider construction industry also requires the work of an even larger pool of labour who are even less acknowledged within the wider architectural discourse. Despite regulation of the building industry having improved considerably in the past century, human rights violations remain widespread in the world’s fastest developing construction sectors, as well as in the extractive industries which supply resources for construction. From March, we invite pitches which address the production process behind architecture’s shiny, rendered facade (please follow the pitching guidelines on our “Contribute” page). Some topics we are especially interested in include: the responsibility architects have for the working conditions on their projects; unionising the architecture profession and workers’ struggles in the construction sector; the problem of architecture as a calling; worker exploitation as a factor in the judgement of an architectural project; working conditions in sectors which supply resources to the construction industry (African sand mines; Indian render farms etc. ); the new role of so-called special economic zones in deregulating the construction industry. We particularly welcome contributions from women, people of colour, people with disabilities and LGBT+ people. For special series articles we are able to provide a fee of €150, all thanks to the generous donations of supporters who make sure Failed Architecture can stay independent.